What the "change" really means in change in working capital. The difference between "working capital" and "change in working capital." How to calculate changes in working capital properly with examples. How it is used in the owner earnings calculation with examples. Today is the day the dust on the topic of changes in working capital finally settles. Read this page slowly, and download the worksheet to take with you because the whole topic of changes in working capital is very confusing. The spreadsheet includes examples, calculations and the full article. Just click to share the article to unlock the download or click here to get it via email. It's taken a lot of thought over many years to fully understand this idea of what the "change" in changes in working capital actually means and how it should be applied to valuation and financial analysis. Here's another quote from Munger before I dive into things as it sums up this topic well. First, working capital is not the same as the change in working capital. If you just want the definition of working capital, it's simply this: current assets - current liabilities. But what you really need to know about working capital is how and why it matters. That's where the "change" comes into play. Previously, I concluded that it was all about the difference from the current year and the previous year. How changes in working capital affect cash flows. But a different view is needed for investors when analyzing and valuing stocks. Instead of an equation just telling you what working capital is, the real key is to understand what the change part really means, how to interpret and use it when analyzing and valuing companies. Let's start with the definition of working capital again. Working capital is a balance sheet definition that only gives you insight into the number at that specific time. However, the real purpose any business has for working capital is to continue operating the business. That's the real purpose of working capital. Not to see whether there are more current assets than current liabilities. If you are a business owner, it makes no sense to constantly check whether you have more assets than liabilities on the balance sheet. "companies strive to reduce their working capital cycle by collecting receivables quicker or sometimes stretching accounts payable." Note the emphasis on the word "cycle." It's not talking about a value from a single point in time. It's referring to the entire cycle that businesses constantly try to shorten. What this also means is that, when talking about working capital needs, you need to break it down to consider the operating aspects only. Just like how capital expenditures can be broken down between growth capex and maintenance capex, working capital has to be broken down to "operating working capital." Another name for this is noncash working capital because current assets includes cash, which is not used to operate the business and has to be taken out. To save time and for simplicity sake as I write this, I'm going to take the numbers from the Cash Flow Statement of the Old School Value Analyzer. This is how the change in cash flow section is broken down. Some uncommon current assets found in the financials. Increasing any of these requires the use of cash. Current liabilities also include debt which is not an operating factor of the business. Accounts payable and accrued expenses. Some uncommon current liabilities found in the financials. Increasing any of these requires delaying the use of cash. This is the difficult and confusing part. Read and chew on it slowly so you can digest it fully. Ultimately, the change does not mean the difference. That's the problem I fell into. 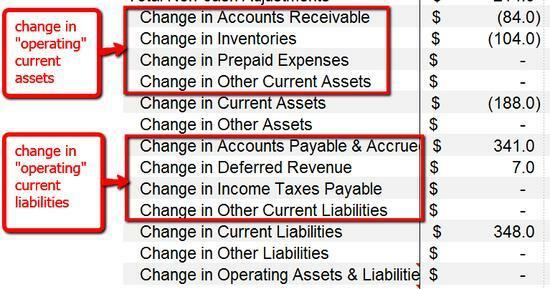 You should not just grab these items from the balance sheet and calculate the difference. Calculate the working capital in year 1 from the balance sheet. Calculate the working capital in year 2 from the balance sheet. Subtract to get the "change." But there is a formula that I've provided in the next section. 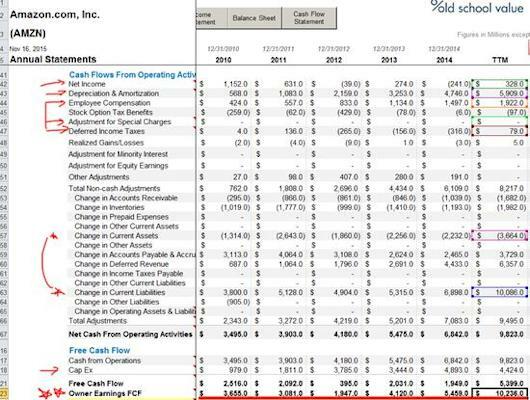 Change in working capital is a cash flow item, and it is always better and easier to use the numbers from the cash flow statement as I showed in the screenshot. The "change" refers to how the cash flow has changed based on the working capital changes. You have to think and link what happens to cash flow when an asset or liability increases. If current assets is increasing, cash is being used. If current liabilities part is increasing, less cash is being used as the company is stretching out payments or getting money upfront before the service is provided. To tie this together, the "change" is about determining whether current operating assets or current operating liabilities is increasing. If the final value for change in working capital is negative, that means that the change in the current operating assets has increased higher than the current operating liabilities. If change in working capital is positive, the change in current operating liabilities has increased more than the current assets part. Put another way, if change in working capital is negative, the company needs more capital to grow, and therefore working capital (not the "change") is actually increasing. If change in working capital is positive, the company can grow with less capital because it is delaying payments or getting the money upfront. Therefore working capital is decreasing. These two last sentences are also the keys to calculating owner earnings properly. Earlier, I said it's not a good idea to grab the numbers from the balance sheet to calculate this. But if you're looking at a company where you can't find the numbers from the cash flow statement for whatever reason, here's how you do it and how the data from the OSV Analyzer is provided. Let's compare the changes in working capital between Microsoft (MSFT) and Apple (AAPL), and then Walmart (WMT) and Amazon (AMZN). Without showing you the numbers first, my initial guess is that because Microsoft is mainly a software business, its change in working capital should be positive. Microsoft can grow with less capital. Apple, being more focused on the hardware side than Microsoft, should show a negative change in working capital. Or even if it is positive, it should require more capital than Microsoft to grow. I'm surprised by the change in working capital for Microsoft, as it fluctuates regularly. If you go through the items, the takeaway here is that Microsoft is collecting more from its AR balance and increasing inventory. In 2015, Microsoft used more muscle to extend payments to reduce the capital needed to grow. The TTM number is lower than 2015 due to an increase in inventory and lower accounts payables (being a good customer). While there aren't any red flags or signs of constant working capital needs by Microsoft, it's not as good as I initially thought it would be. A totally different story where change in working capital is consistently positive. Current operating liabilities has increased more than the operating assets each year. Positive change in working capital means that the company needs less capital to grow. Based on just change in working capital alone, Apple is the better and more efficient business. Better value than Microsoft, too. Another comparison to study is Walmart vs. Amazon. Surprising again because Walmart has been spending less on inventory since 2014. For such a capex-heavy business, they've now worked to improve the way working capital is being used. Previously, Walmart kept having to pay for inventory faster than it was paying its bills. It needed a lot more cash to keep growing. However, the big shift in 2015 is due to the huge leap in accounts payable resulting in positive change in working capital (it is delaying payments to vendors and suppliers to improve its cash flow). Amazon, on the other hand, does things differently. Over the past few years, Amazon has been spending even more on inventory than Walmart. Its accounts payables is consistent, but the deferred revenue is the awesome part. The rate at which it is collecting cash upfront before an item or service is provided is growing exponentially. This is such a difference from the Walmart model. As Walmart continues to improve and focus on its ecommerce business, its numbers should shift to look more like Amazon going forward. Amazon is able to accept the cash first, use it to grow operations, then after awhile provide the goods or service to the customer. The whole point of understanding changes in working capital is to know how to apply it to your cash flow calculation when doing a DCF. Specifically, how do you use changes in working capital to calculate owner earnings? Buffett's brief mention of working capital in his letter when he first brought up the idea of owner earnings honestly made things even more confusing. Here's how I interpreted it previously. "Buffett also mentions 'additional working capital' in the paragraph. He says that additional working capital 'should be included in (c).' This means that on any given year where additional working capital is required to maintain the business, it should be included in capex. Otherwise, the rest of working capital should be excluded from owner earnings." And this is where I got it wrong. I was too caught up with whether it should be excluded or included and how to calculate it. If you went through everything in this article up to this point to truly understand what the change means, Buffett is simply talking about the importance of cash flows due to working capital. The increment he is referring to is the increase in the current operating assets as mentioned above. Whether the asset or liabilities side has the increment is going to determine whether you include or exclude the change in working capital. Walmart has to continually buy more inventory to maintain its competitive position and unit volume. Again, Buffett isn't going into the specifics of whether to add or subtract the number. He is saying that you should think about how the cash flow requirements of the business will affect the final owner earnings calculation. It's also a case-by-case basis. If the change in working capital is negative, that means working capital increased as the company needs more capital to grow. This reduces cash flow and so it should reduce the owner earnings (excluded in this case). If change in working capital is positive, that means working capital decreased as the company has more cash for the company to grow and play with. This increases cash flow and so it should be added to owner earnings (included in this case). 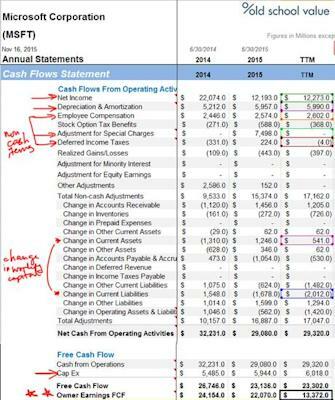 My problem was that I was looking at the numbers too much without seeing the entire picture of cash flow. This led me to my mistakes in the calculations. However, when you look and think about each component and simplify it to the two points above, it makes the entire calculation that much easier. The overall owner earnings formula is still accurate. Numbers and formatting are from Old School Value. You can get these numbers from the SEC filings, too, and follow the examples. Other noncash charges = $2,598. Changes in working capital = ($1,471). Because change in working capital is negative, it should reduce FCF because it means working capital has increased and decreases cash flow. Although the change in working capital is negative, you don't subtract it to do a double negative. That's why the formula is written as +/- changes in working capital. Calculate the change in working capital. Determine whether the cash flow will increase or decrease based on the needs of the business. I'm going to show five years of results for Amazon to show the hidden strength of what changes in working capital can reveal when used with owner earnings. Unlike Microsoft or Walmart, Amazon's change in working capital is positive. It is added to the owner earnings as the company needs less capital to grow and so it will increase cash flow. Other non cash charges = $2,001. Changes in working capital = $6,422. Owner Earnings = 328 + 5909 + 2001 - 4424 + 6422 = 10,236. And because of the strength in its business model, the owner earnings greatly outpace the standard FCF calculation. For most companies you analyze, by using the change in working capital in this way, the FCF calculation and owner earnings calculation is similar. Only when there are big differences in changes in working capital will you see a divergence between FCF and owner earnings. The fundamental purpose of even discussing working capital is about cash flow needs of a business, not the balance sheet calculation. Change in working capital is negative. Subtract the change from cash flows for owner earnings. Change in working capital is positive. Add the change to cash flow for owner earnings. FCF calculation example using changes in working capital. DCF calculation with change in working capital explanation. Professor Damodaran on noncash working capital.